Whenever Nick Baptiste, Justin Bailey and Evan Rodrigues would crowd around the TV in Rochester and watch NHL games, this was the kind of day they envisioned. They'd be on the ice together for the Buffalo Sabres, joining forces to take it to an established team like the Chicago Blackhawks. And they took it to them Saturday. 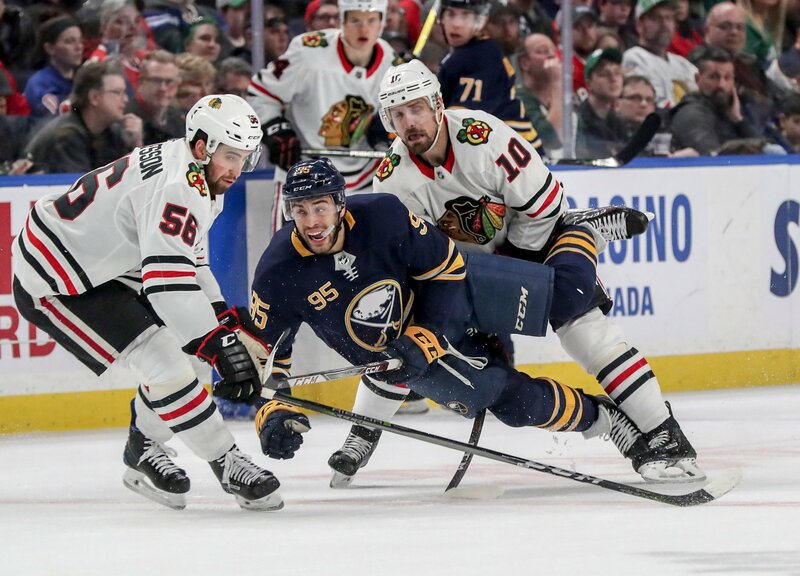 Put together as linemates during the third period, the three young players sped past the Blackhawks, making plays, creating scoring chances and – more importantly – finishing those chances. Baptiste tied the game early in the third and scored the winner with 1:56 to play, lifting Buffalo to a 5-3 victory. "We were flying," Baptiste said in a jubilant KeyBank Center dressing room. "We were really going in that third period. It's exciting. We're all three guys that are trying to really establish ourselves in the NHL. We're going 110 percent at all times. "It's a tough league to play in, but when me and Justin, especially, are moving our feet like we did, we're hard to defend against. When you have us moving our feet like that and Evan making plays the way he does, it's hard to stop. "I was just happy to get out there with those guys and have an impact on the game." The joy was evident in Baptiste's words and goal celebrations. He lived it up, and he deserved the party. He scored his first game-winning goal and had his first two-goal game. The Ottawa native also did it in front of his mother and brother, who saw him score in person for the first time. "I was jacked up," Baptiste said. "It's been a good weekend for me, and I just want to keep it rolling." The Sabres want the three players to keep rolling. Actually, they need them to keep rolling. The third-year pros have long been regarded as key components of future success, but the road hasn't always been smooth. They rolled over it with ease Saturday. "There's a lot of opportunity," Bailey said. "That's been communicated to us before the game. We are wanted to give the team a spark, and I think that's just what we tried to do. "We're really good friends. We've worked hard together down in the minors. We got the opportunity to play together, and it was a huge goal by Nick. I think our line as a whole, we were hemming the 'Hawks in, giving our team energy through the third period." The bond the trio has built through the years was evident in its drive on the ice. Once they united, each player seemed to push the other. "We got a little excited when coach put us out there together," Rodrigues said. "It's a business, and we've all been wanting to make it. When you have been playing together for three years and you know all of us are up here, it's exciting. "When we got a chance to play together, I think we all had a little extra giddy-up in our step, and I think we showed that." The 24-year-old Rodrigues is well on his way to proving he's an NHL regular. He has six goals and 18 points in 37 games this season, showing speed and playmaking skills. Bailey and Baptiste are still finding their footing. Baptiste's goals were just the third and fourth in 22 games this year. Bailey has three goals in 10 outings, but he's bounced back and forth between Rochester and Buffalo. "Everyone wants to score goals," the 22-year-old Baptiste said, "but my focus is helping this team win whether that's blocking shots or chipping pucks in and get on the forecheck or scoring two goals. I'm just trying to do whatever it takes to help this team win. "I'm focused on us getting wins and getting this team back to where it should be." In order for the Sabres to become a playoff contender, they need their young players to mature and develop. Baptiste, Bailey and Rodrigues took an impressive step against the Blackhawks. 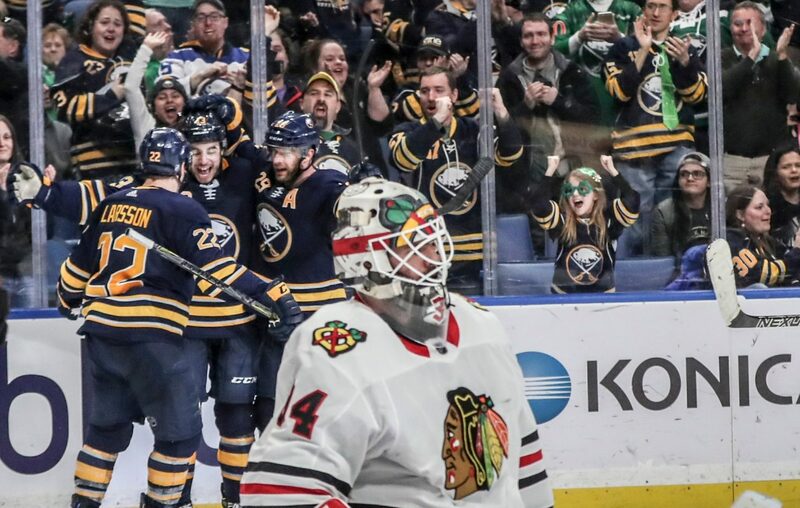 "They really provided the spark," Sabres coach Phil Housley said. "That’s what we were looking for, especially from our young players."